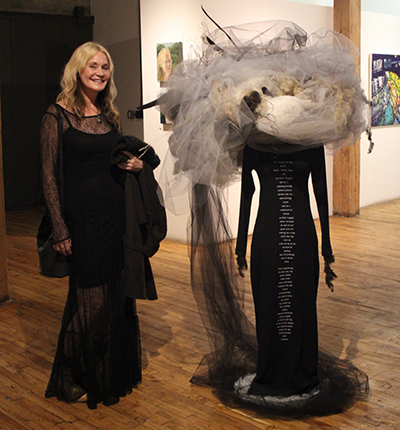 Antonini with her work “Squall.” Tulle, feathers, grass, glass, raw wool, original text, silkscreen on re-purposed dress. 2013. 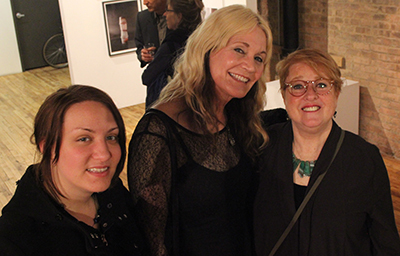 InterArts student Lilli Kayes, Antonini, and exhibition organizer Fern Shaffer. 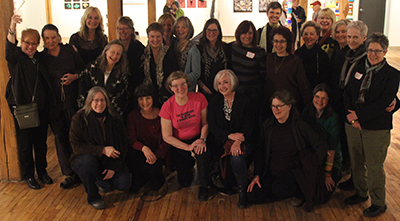 The ambience in the room was joyful as the crowd looked at the artwork amidst hugs and animated discussions. The exhibition runs through June 13, 2014 and is open Monday through Saturday 8:00 a.m.-6:00 p.m. and Sunday 8:00 a.m. -noon.